Although the Shadowhunters of the London Institute are no closer to finding their enemy, Mortmain, they know that it is only a matter of time before he strikes. Tessa is the key to his plan to exact revenge on the Shadowhunters, and she must be protected at all costs. Unfortunately, the Consul refuses to believe that the threat of Mortmain and his clockwork army are imminent, and he denies the Institute’s request for support in the battle to come. When Mortmain finally decides to make his move, it is Will alone who must save Tessa, for Jem’s health has taken a turn for the worse. Although he is reluctant to leave his parabatai’s side, Will races to rescue Tessa before Mortmain unleashes his automatons to obliterate all of the Shadowhunters. Clockwork Princess has left me an emotional wreck. I don't have the motivation to continue on with my boring life without Will and Jem waiting for me at the end of the tunnel. By the Angel, how can I read another book after this perfect one? Clockwork Princess is unrivaled in its glory. If I ever needed therapy for the end of a series, it should most definitely be for this one. I honestly do not know how to go about reviewing a book like this. I will do my best to organize my fangirling into a seemingly coherent string of thoughts. Jem. Will. Jem and Will. Will and Jem. Ah, these two boys make the whole series for me. For so long, my life has revolved around them. I love Jem and I love Will. That's the thing about them—you can't love one without loving the other. Their friendship kills me. I can't put into words how moving their relationship is. Jem would easily lie down and die for his parabatai, and Will would do the same for Jem. In this book, more so than the others, the trauma of Jem's impending death and Will not being able to follow him where he shall goest is present and intense. Knowing Jem and Will, you know that Tessa can't and won't be the reason for tearing them apart. I used to think that their inseparability was stronger than steel; the realization that death is stronger than the strongest steel is heartbreaking. Tessa, Tessa, Tessa. This girl! Tessa is such a great protagonist. I commend her for her heroism. I love how Tessa relies on her head more so than her abilities and bodily strength. Not everyone has the power to shape-shift or has unwavering strength and stamina—everyone does have a brain. It makes Tessa easier to relate to. I love how she loves books and connects to the story, losing herself in the characters much like I do. Most of all, I love how she loves Will and Jem, both of them equally. Tessa never disappoints. It's hard to dislike any of Clare's Infernal Devices characters—even Gabriel Lightwood. The other characters were just as great. Charlotte and Henry are so cute! It was adorable watching them opening up after discovering their true feelings for each other. Henry and his tinkering become more visible this go-around, thanks to the lovable Magnus Bane. Magnus and Henry team up together to work on new technology for the Shadowhunter world. It was lovely to watch their growing friendship. A new character introduced was Cecily Herondale, Will's younger sister. At first, I expected to dislike her for plotting to bring Will out of the Shadowhunter life. That wasn't the case. Cecily was refreshing and reminiscent of the girly yet badass Isabelle Lightwood from The Mortal Instruments. Now, Sophie and Gideon. Their sweet side-romance was so endearing. It was a nice diversion from the more prominent and intense storyline. Another aspect I love about Clare's books (besides Will and Jem) is that she completely drags me into the story she’s created. I've never wished to take part in a story as badly as I want to in this case. When people ask me about my prospective career paths, I want to say Shadowhunter. I crack Will puns when I'm surrounded by people who haven't read the series. I've acquired an unexplainable fear of ducks. Needless to say, this series has taken a tight hold of my life. Now that it is over, I have little Jem, Will, Tessa, Magnus, Charlotte, Henry, Gideon, Sophie, and even Gabriel holes littering my heart. These little holes add up. Clockwork Princess is a book that I couldn't read fast enough. You can only read so fast, and I was recklessly racing towards the end. Now that I've reached the end, I don't want to be here! I want to go back to the beginning and forget everything. I want to meet Will and Jem all over again. I want to relive the story all over again. I need to start over because then perhaps it won't hurt so much; it won't seem as definite. I read this quote the other day by the famous Dr. Seuss: “Don't cry because it's over, smile because it happened.” By the Angel, I'm trying to apply this piece of wisdom to this situation, but it's so hard. What can I say? 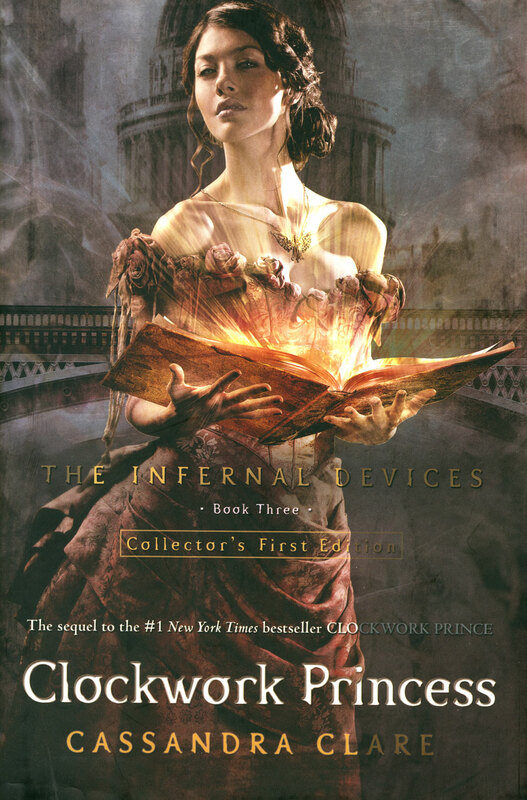 The Infernal Devices was my whole existence—now that it's over, I'm going to need time to recover. The ending of a series has never hurt as much as this. From the moment that I read the last sentence in Clockwork Prince, I knew with one hundred percent certainty that Clockwork Princess, the final book in a series that I love beyond measure, would leave me shattered. And yet, here I sit, two days after some marathon reading sessions that commenced on a late Thursday night and concluded late Friday/early Saturday morning at 2:30, still at a complete, total, and utter loss for words. Even if I wait a few days to try and write this review, it’s not going to get any more coherent. What follows, then, isn’t so much a review as it is an outpouring of the myriad emotions that I continue to feel despite having had some time to process my thoughts about this book. That’s precisely the problem—I can’t process my thoughts about this book! While my initial reactions upon finishing Clockwork Princess ran the gamut from shock to euphoria to sadness, the overriding emotion was astonishment. I am in absolute awe of how Cassandra Clare plotted this novel and how she tied the entire series together. My God. Although not everything that happened in Clockwork Princess came as a surprise, the path that led to an outcome wasn’t always what I’d expected. And then there were the twists that completely blindsided me and sent my head into a spin so frenzied, I had to put the book down so I could collect my scattered senses. I don’t think a book as ever sparked such intense feelings in me before. Just about every line of dialogue uttered by Will, Jem, and Tessa cut right through me. Oddly, though, I’d thought that I’d cry my way through this book, but for the most part, I managed to stay dry-eyed. I think I was just too stunned and in quite a bit of denial while I was reading. I finished this book at 2:30 in the morning, caught a few hours sleep, and proceeded to begin sobbing as soon as I woke up. It seems that everything that I’d read hit me all at once. Obviously, every aspect of Clockwork Princess was outstanding to me, but I’d like to make special mention of how exquisitely Clare described Jem’s violin playing. I’ve always found it difficult to discuss music with words; I wish that I had Clare’s gift for bringing it to life with prose. There’s one scene in particular that is so beautifully written and incredibly moving; it became an instant favorite the moment I read it. What I will always remember about this book and the series as a whole is its theme of the transcendence of love, whether it’s romantic love or the fraternal love that Will and Jem have for each other. How love, in the truest sense of its definition, transcends even time. How love means accepting another person’s flaws and putting that person before oneself at all times and without a second thought, like a reflex. How love is unconditional. In this case, there are three people who understand what it truly means to love: Will, Jem, and Tessa. They are tied so inextricably to one another that it’s impossible to imagine one without the other two. And that’s what I think makes this love triangle superior to all the others I’ve read about in YA. I do not doubt that these three characters would do anything, including die, for each other. I’ve seen too many love triangles in which a female protagonist thinks she’s in love with two guys at the same time. To me, qualifying “I love so-and-so” by putting “I think” in front of that statement signifies you’re not sure. I believe that it’s possible to care deeply for another person, but when it comes to using the actual word “love,” I don’t like seeing it thrown around casually. I believe that saying “I love you” to someone is equivalent to telling that person you love him/her with every single subatomic part of your heart and nothing less. And whenever Will, Jem, and Tessa use the word “love,” I believe they mean it with all of their hearts. 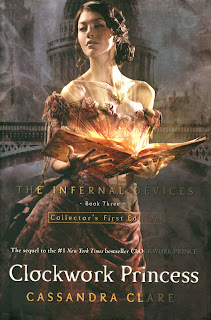 The Infernal Devices has also always emphasized a love of books that has resonated with me since Clockwork Angel. When I read this series, I immerse myself completely in this world. I can’t view these books from a reviewer’s perspective at all; as I’m reading, the last things on my mind are plot, setting, tone, etc. I love these books for the pure happiness they bring me, even when they make me cry. They remind me why I love reading so much in the first place. For a while, I’m lost in another time where good must find a way to triumph over evil and angels, demons, vampires, werewolves, and warlocks exist and a young man’s fear of ducks makes me laugh. Seeing this series end breaks my heart; saying farewell to it is like watching your best friend walk away for the last time. The luxury of having books for best friends, though, is that they’re always only a read away; all you have to do is go to your bookshelf for an immediate reunion. Excellent reviews ladies. I am struggling to write mine...too many thoughts that I can't put into words. Lee, love your statements on love and love triangles. So very well said. Ally and I both said to each other yesterday that this was the toughest review we've ever had to write. Just so many emotions. We're still a long way from recovering from reading this. I don't think mine is coherent at all, lol. It's more one long "I loooooovvvve this book and this series" ramble than anything. I'm glad Ally joint reviewed this with me because there were so many things I forgot to mention amid my fangirling. I want to reread it from the beginning, too! I haven't read another book since I finished Clockwork Princess; I'm finding it so hard to move on, which sounds silly, I know, but I'm that attached to these characters! "Emotional wreck" and "shattered" are spot-on descriptions of the aftermath of reading CP2. Cecily was a really pleasant surprise for me. Not only was she a spunky character (whom I adored), but her relationship with Will was just so precious! It's rare to see really great sibling relationships in YA book, but there's was perfect. "Saying farewell to it is like watching your best friend walk away for the last time." That's exactly it. I'm so not ready for this series to just be over, but knowing that the characters I love are okay makes saying goodbye just a little easier. BTW I saw that your blog design was CP2-inspired for a while and I just wanted to say that it was really really cool! Thanks! We wanted to do something special for the release of CP2, so we decided to do a TID-themed design. I still often find myself grabbing CP2 off my shelf and flipping to my favorite scenes (pretty much the whole book, lol). I think it's finally sunk in that the series has concluded, and what makes accepting this a little easier is knowing that in a lot of ways, the story of this group of Shadowhunters continues in the other Shadowhunter series.